Are you in the market for something special for your garden? Why not consider replacing your natural lawn with something that will really brighten your home in the long run? We here at Great Grass deal in nothing but the finest artificial grass products so that you’ll never be without a wide range of choices, but we’d like to recommend our 25mm Premium Grass for your consideration today as it’s proven popular in the last few months! We opted for a great balance between tall and short with the pile height of our 25mm Premium Grass, finding that fantastic middle ground with the help of our innovative Clever Yarn technology. With this artificial grass in particular on your side, you’re guaranteed a lush, natural beauty like no other, coupled with the highest standards of resistance against common hazards such as bad weather and flattening underfoot. If you’ve never heard of Clever Yarn before, it’s the uniquely designed technology working behind the scenes of all our most popular artificial grass products, ensuring that your chosen product has a strong latex backing and a cleverly crafted stitch pattern that allows each individual blade of grass to bounce back into place. This not only simulates the realistic feeling of natural grass underfoot but also helps to ensure that your grass will stay bouncy and looking lush for a long time to come. Add that to the fact that our 25mm Premium Grass is free draining, allowing rain water and other liquids to wash away underneath the artificial turf, and you can rest assured knowing your garden will be a low maintenance, evergreen paradise even when the temperature begins to drop again. You really don’t have to take just our word for it either, as we’re more than able to ensure you can inspect the top quality of our artificial grass for yourself. 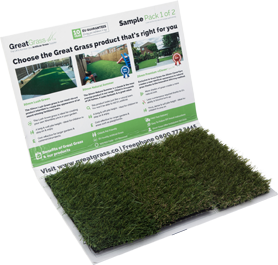 Simply give us a call or get in touch to order your very own free sample pack, and you’ll be able to see first-hand just how much innovative technology and design has gone into ensuring that our artificial grass is the best you’ll find on the market today. So what are you waiting for? Here at Great Grass, we’re specialists when it comes to top quality providing artificial grass that you just couldn’t do without, specialising in fantastic products such as our 25mm Premium Grass and more. Make sure you don’t wait to get in contact as soon as you can, as we can’t wait to lend you a helping hand and deliver the very finest artificial lawns no matter where you need them.